Whenever I crave a reminder of student life on la Cote d'Azur, I make Pissaladière. The bakeries in Nice serve it as a snack in huge delicious square slabs presented simply on baking parchment. Across the border in San Remo, Italy, you'll find they add mozzarella, but not so en France. They love it just as it is and rightly so. If there's one thing the French are not scared of in their cuisine, apart from garlic obviously, it's salt. The devil food for many, for me it has a grounding, earthy effect. 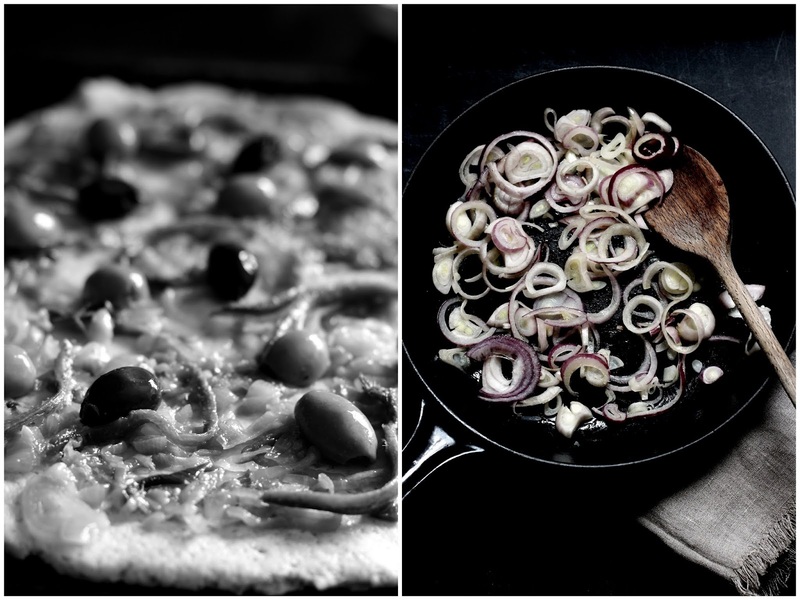 The anchovy-olive-onion mix in Pissaladière could only be Niçois and is salty to the point that you are transported instantly to a place near the sea. Oozing with its slowly cooked onion 'paste' which sets off a simple dough base, Pissaladière makes a wonderful weekend sharing food. I've committed culinary blasphemy in this recipe and added some courgettes (zucchini) as they were fresh out of the garden, but you'd never see that in Nice. Just like pizza, it's perfect for freezing too so if you make too much you can have a beautiful snack really quickly. Hope you love it too! 8 oz flour (I used 4 oz brown bread GF flour with 2 oz GF self raising and 2 oz spelt to give some texture). 1. Make the dough by combining the flour, salt, pepper, yeast and sugar well then adding the warm water and olive oil. Knead to a dough (with low gluten flours try to work with wet hands so it doesn't stick). Do add a little more flour if the mixture is too wet though. Set aside in an oiled bowl with a damp tea towel over the top and leave in a warm place for 30-40 minutes to prove. 2. Meanwhile, put your oven on to about 180 degrees. Slice the onions and slowly cook them in a heavy based pan on the hob on a very low heat, placing a piece of tin foil tightly over the top so they start to soften. This usually takes about 10-20 minutes. Keep stirring them and if needed add a little water so they don't stick to the bottom of the pan. 3. When the dough has risen, roll it out on an oiled surface then roll over the rolling pin and transfer it to a baking sheet. Add the onion mixture, anchovies, olives and courgettes and space out like a pizza. 4. Bake for 15-20 minutes or until the sides turn golden. Enjoy warm!